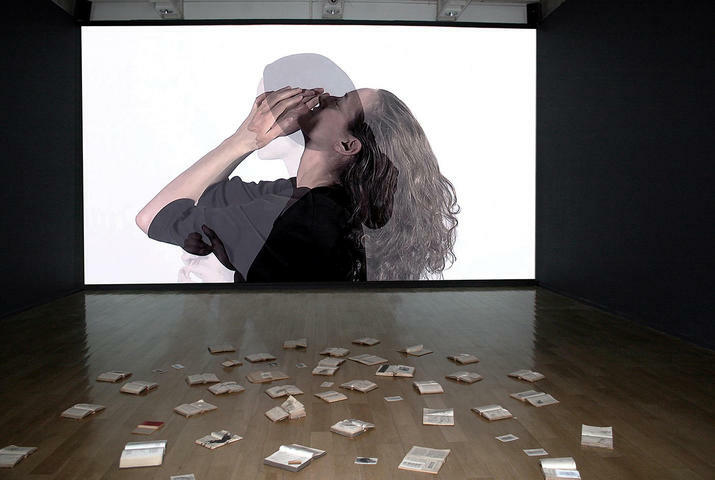 Showing in the temporary exhibitions gallery of the Museo de la Memoria until April 7, 2013 is Monika Weiss’ video installation Sustenazo (Lament II), evoking the hidden story behind Warsaw’s Centre for Contemporary Art Ujazdowski Castle. A large military hospital, its 1800 doctors, nurses and patients were forcibly evacuated in what was, for many, the first step towards death. Monika Weiss’ poetically complex video, [sound, and object-based] installation is an artist’s lament in response to war, a context of time and place in which ordinary people lose all their human rights. And yet war is an occurrence that never tires, never dies; it can always be relied upon to find a new public, new victims. The word surprises: sustenazo... Are we unsettled and frightened? Does the incomprehension of the unknown terrorize us? The word comes from ancient Greek and alludes to the collective lament, the silent, inner wailing and groaning that follows a catastrophe. Faced with a shared disaster the people of a community, the women in particular, would take to the public square, lift their hands to the skies and experience their pain together. That is Monika Weiss’ invitation: to understand lament as being in sorrow together, through her art. The artist left New York – where she lives – to return to her native Warsaw for an artist’s residency at the Centre for Contemporary Art Ujazdowski Castle, followed by an exhibition. During the residency she found out that towards the end of the Second World War, the site had been a large hospital, which was forcefully evacuated by the Wehrmacht army on August 6, 1944, at the onset of the city’s uprising. The overnight expulsion of the hospital and its nearly 1800 doctors, nurses and patients, was an abrupt decision and many of those who were forced to leave were dying as they left. Weiss asks: Why is this site unable to express itself? Why is it possible to move freely around the building without any sense of the concealed violence held within its walls? How do we forget such events? 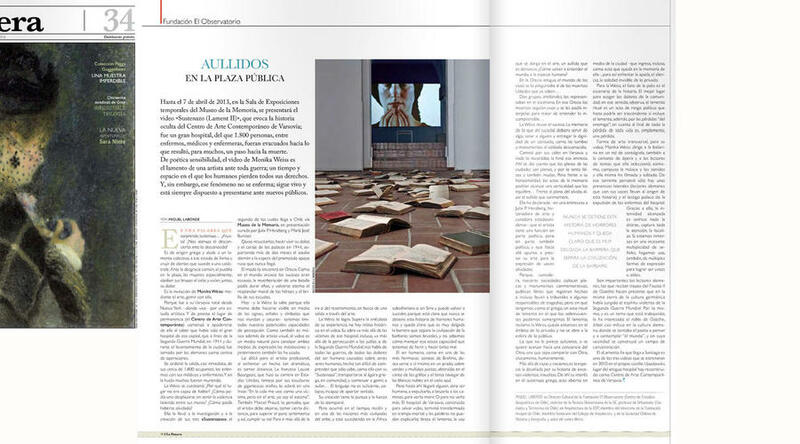 These questions lead the artist to the investigation and creation of the three videos (Laments) in her Sustenazo series, the second of which Sustenazo (Lament II) is exhibited in Chile at the Museo de la Memoria, and curated by Julia P. Herzberg and María José Bunster. Weiss’ project intends to bring to life, to resurrect, the pain and courage of those Polish men and women of 1944 who for more than two months resisted the Nazi siege waiting for the promised help from the Russians, help that never arrived. It was in the ancient Greek ritual lament that the artist found an inspiration. From our viewpoint today in the ancient world large-scale events were few and far between, so the effects of a battle could resonate for years while the moral radiance of the conquering heroes and their bright shields took on allures of eternity. These days our potential capacity for perception is limited; working to establish visibility amid the deluge of signs, symbols and representations that inundate and saturate us, Weiss knows this only too well. Being a musician as well as a visual artist, video is the unique medium for her to channel both means of expression. She also works in installation and performance. For a contemporary artist, the challenge in confronting such dramatic historical events is to take some distance. The French artist Louise Bourgeois, who established herself in the US and is renowned for her sculptures of giant spiders, commented: “In life I see myself as a victim, but in art I am the murderer”. The French writer Marcel Proust also thought that it necessary for the artist to retreat, to take a certain distance in order to be able to overcome the purely emotional, and so be able to undertake their duty. In order to be able to see and witness beyond wrath or abhorrence, and so be able to search for a way out through art. Weiss’s art achieves this. It rises above the anecdotal element of human experience and there is no direct historical narrative in her video. Her work reaches beyond the victims of that hospital, beyond the persecution of the Jews, beyond the experience of the Second World War; it speaks to us of all wars, encompassing all the pain which people and oppressive systems inflict upon one another, a concept so difficult to understand that we can only, as she does with her Sustenazo, return to the agora, to the main square of the Greek community, and among the people begin to groan, to wail... Language becomes insufficient, it collapses, unable to bear the weight of the meaning. Monika Weiss’ work has the purity and strength of timelessness. Yet these events did take place, recently, and in one of the most apparently civilized nations on earth; the same is happening at this very moment in Sub-Saharan Africa and Syria; it will happen again, because it is clear that the horrors humans inflict on each other are endlessly repeated, and that what separates us from barbarity is a wafer-thin barrier; we are brutal and we don’t know how to control our cunning capacity for hurting and damaging other people. The human being, as the Romantic German composer Johannes Brahms depicts in one of his most beautiful sonatas, desperately wants to see herself standing in a meadow amid soft green grass, lost in the chattering singing of the crickets and the white clouds slowly drifting across the blue skies. But then someone else is bound to appear, another human being, to expel the first out of this paradise, to send them out onto the road and watch them die. Or perhaps just to not have to see them any more. The Warsaw hospital, built to save lives, ended up being transformed into a fatal trap, which words cannot explain. The [silent] lament breaks out, the voice reaches out into the air, into a wail that denounces: How can we understand the world and the human race again? In ancient Greece the world of the living asked the dead: You, who already know...Two antiphonal groups represented them on stage. In ancient Greece the dead were still alive and could be questioned on the stage, in order to try to understand the unfathomable...Weiss resurrects the event. The memory of what happened there must have some sort of a purpose, must help someone, must provide the dignity of consolation to someone, as the tombs and monuments of the unknown soldiers do. Walking along the streets of Warsaw she realized that nobody had any memory of the hospital’s history, and the collective amnesia wounded her. She realized that the city’s streets are one-dimensional, and therefore false and mute. But faced with such horizontality, acts of memory can establish a verticality that could bring about a measure of equilibrium... Faced with oblivion, lifting a voice in a commemorative wail. In an interview with the American curator and art historian Julia P. Herzberg Weiss asserted that an artist has a function that is in part poetic, but also partly political, and that this is the direction she has been pursuing, lending her art to the expression of forgotten voices. According to Weiss our society is adept at creating commemorative plaques and monuments, at publishing books that register facts, and even at bringing to international tribunals some of those responsible for genocides, but we don’t have, as the Greeks did, a ritual act of lament in which the survivors can submerge themselves. The lament, Weiss asserts, remains a private process and is not part of public life. And if one aims to develop towards a consciousness of the Other, a way of learning to share with the Other civilly and humanely, this is simply not enough. Beyond race and nationality we humans are challenged by our history of outrageous, excessive violence. This is where Weiss’ interest in the ancient Greek word sustenazo comes from, and her interest in public act of lamentation, performed in the middle of the city –as an act entering into the collective memory of that city – so as to confront apathy, silence and the invisible solitude of the private sphere. For Weiss the public forum of the people is the stage on which history is played out. It is the place best adapted to embracing the pains of the community; in this sense, she observes, the ritual of public lament is also a political act that has a potential to be transformative, especially if the lament were to include the loss of “the enemy”, as the loss of any life, quite simply, as a loss. 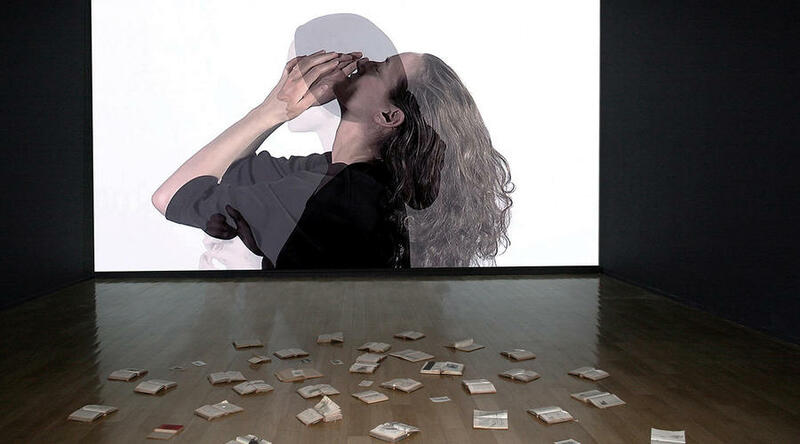 Crossing multiple art forms in her work, Monika Weiss is the author, the choreographer and the composer; she directs her dancer and her opera singer, and the readers of the texts she chose. The artist composes the music and soundscape herself, as well as films and edits her video. Amid this profusion of hands-on involvement there are also external elements present: the readers reading in German, their voices alluding to the origins of this story; and the Polish witness and participant of the evacuation of the patients from the hospital. Thanks to this absorption, the intensity becomes almost dreamlike: nothing distracts, our attention is entirely captured and focused. As we are used to being immersed in an endless multiplicity of signs, we are also able to use multiple forms of expression in order to be seen or heard. The German readers reciting extracts from Goethe’s Faust II are important: they remind us that from the same fertile ground of German culture came the violent spirit of the Second World War. For the same reason Weiss is interested in and is developing a project inspired by Goethe’s Oak tree. Under this tree, almost mythical in German culture, the poet sat, thinking and contemplating “the world”. Around this tree a concentration camp Buchenwald was later deliberately built. Sustenazo (Lament II) shown in Santiago is one of the three videos exhibited in 2010 in the Ujazdowski Castle, site of the old hospital and today restored as the Warsaw Center for Contemporary Art. MIGUEL LABORDE is the Cultural Director of the Fundación El Observatorio (Centro de Estudios Geopoéticos de Chile – “Chilean Centre for the Study of Geopoetics”); the director of the university magazine of the Universidad Católica de Chile; professor of Urbanism (Chilean Cities and Land) in the Department of Architecture of the Universidad Diego Portales; member of the governing body of the Fundación Imagen de Chile; honorary member of the College of Architects and the Chilean Society of History and Geography; and the author several books. Translated from Spanish by Miriam Heard.